If you ever start to wonder whether there’s anything more out there these days than a rehashing of existing ideas in the tech field, a quick trip to a Maker Faire will answer your question definitively. Absolutely. 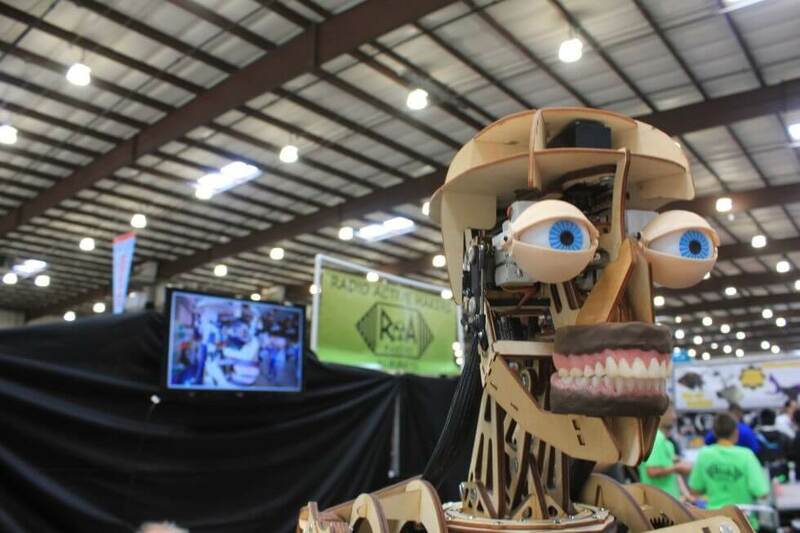 At the 11th annual Bay Area Maker Faire, held at the San Mateo County Fairgrounds this past weekend, there was an abundance of wild, wacky, fun, ingenious, clever projects and ideas on display. Most of them have a tech angle—though not all—and some of them are meant to be the start of, or enablers for, full-fledged commercial endeavors. The simultaneous growth of crowdfunding sites like Indiegogo alongside the rising popularity of the Maker movement has had a particularly strong impact on Makers, inventors and entrepreneurs who want to turn their ideas into real businesses—particularly those who want to build something. It’s now very feasible to go from an original concept to a commercial success using nothing more than what was available from companies demoing their wares at the Maker Faire. From Arduino, Raspberry Pi and all their single-board computer brethren to 3D printers, desktop-size laser-etching machines, and low-cost CNC (computer numerical control) mills, the Maker Faire offers an amazing collection of tools that regular people did not have access to even just a few years back. Using these kinds of devices, individuals can now create products that look and function on a quality level that is as high (if not higher!) than many major commercial entities. The timing of these developments is particularly relevant for the tech hardware business. We’ve entered an era when many of the innovations in major devices—smartphones, PCs, tablets—have noticeably slowed. However, there’s an explosion of innovation going on in more specialized areas like consumer and commercial IoT applications. The Maker movement is ideally suited to drive critical innovations in IoT because of the kind of specialization and customization that many IoT applications require. The Maker movement is ideally suited to drive critical innovations in IoT because of the kind of specialization and customization that many IoT applications require. Plus, the truth is, many of these kinds of products are probably going to be much lower volume than would be necessary to justify their ongoing existence in large companies. But they are likely more than enough to sustain and grow a wide range of small businesses. In other words, the kind of creative hardware projects that stem from Makers are exactly what the world needs right now. But knowing there’s a need and turning that killer idea into a real business still isn’t that easy. For one, it’s hard to find people who are experts in all the disciplines used to make a modern connected device. One possibility is to leverage the creative communities that have built up around the Maker movement—both virtually and physically—to learn the requisite skills. A related possibility is to join something like TechShop, the Maker-friendly company that offers all the kinds of tools I was describing earlier (and even bigger, more professional versions), and take some of the classes they offer to learn how to use those tools. Once you have the skills, you have to move onto the manufacturing, and this is where many people get stuck. If you’re fortunate, you can connect with funding sources like venture capital firms and get connected to manufacturing sites like factories in Shenzen, China or perhaps to a US-based contract manufacturing firm like Flextronics. But most of those efforts are for companies who want to build in the tens or hundreds of thousands of units, and who are shooting to be the next billion dollar unicorns. Many of the Maker-driven efforts are likely to look at hundreds or just a few thousand units and businesses that create revenues that shoot for six or maybe seven digits—not nine or ten. Until recently, this was a tough spot to be in. Thankfully, one of the more interesting announcements from the past weekend’s Maker Faire was a new collaboration between Indiegogo and Arrow, the large electronics distribution firm. The companies are putting together what they’re calling a platform to move from crowdfunding idea to full production, with the promise of lots of help along the way. There is a range of options available, with a lucky few projects receiving $500,000 worth of support, but it basically allows Maker inventors to get access to Arrow’s product design tools and engineers, prototyping capabilities, supply chain expertise and much more. Arrow plans to assess and then select a variety of Indiegogo projects based on their technical viability, manufacturability and potential market impact and then mark certain ones with an Arrow logo. From there, they will work with those individuals/companies to make sure their products come to market—not always a given for many crowdfunded ideas. As we move deeper into the Internet of Things and continue to see Makers help drive the kinds of innovations that are going to be necessary to succeed in this burgeoning field, removing impediments that keep creative ideas from becoming reality will be essential. So it’s great to see new efforts that really can turn Makers into manufacturers. Bob O’Donnell is the founder and chief analyst of TECHnalysis Research, LLC a technology consulting and market research firm. You can follow him on Twitter @bobodtech. This article was originally published on Tech.pinions. Header image credit: Ars Technica.